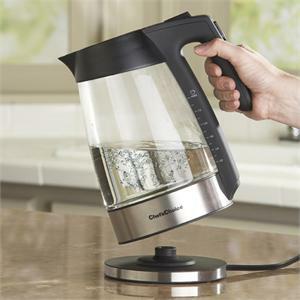 Watch your water quickly come to the temperature you need for green, oolong or black tea. Faster than a stove or microwave and using less than half the energy of heating water on an electric stovetop, the Model 679 is as functional as it is stylish. Handsomely crafted from heat resistant glass and brushed stainless steel, it features a 360º swivel cordless design, soft touch handle, convenient single-hand lid opening and an illuminated on/off switch. The concealed heating element, efficiently delivers 1500 watts of power. This transparent kettle makes boiling water a visual delight and takes all guesswork out of water levels! 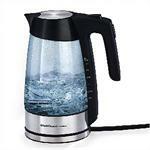 Its generous 1 ¾ quarts capacity is ideal for heating water for instant soups, hot drinks, teas and blanching vegetables. 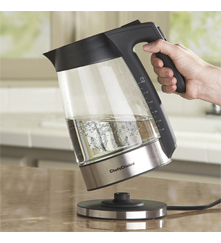 Safety features include automatic shut-off, dual boil-dry protection, cool touch bottom and lid-lock. This is the model our owners use at home.